I speak from personal experience. A perfect pillow is an absolute must-have for a good night’s sleep. And everyone will have a different requirement for the kind of pillow that works best for them. So how do you know how to pick the best bamboo pillow if that’s what you’ve decided on for your comfort? Bamboo pillows are made with sustainable bamboo materials intended to be better for you and the environment. These pillows are usually made with a combination of materials for maximal comfort. If you are looking for where to buy bamboo pillows, you’ve come to the right place. We also take a moment to answer the question, “Can you wash bamboo pillows.” Read our bamboo pillows review to learn more about buying the best one for you and it’s care and comfort. Can you wash bamboo pillows? 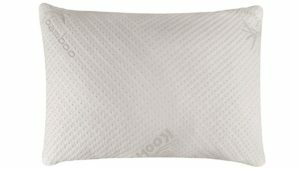 The UTTA Sandwich Sleeper is one of the top bamboo pillows on the market. It’s particularly good for side sleepers. We get a lot of feedback from side sleepers or people who need extra support due to neck or shoulder pain. This bamboo pillow from UTTA is actually adjustable to help everyone find exactly the right level of comfort. It features an adjustable height by offering several inserts to change the thickness of the pillow. The bamboo cover is washable and keeps sleepers cool, which is another big issue for a lot of people. 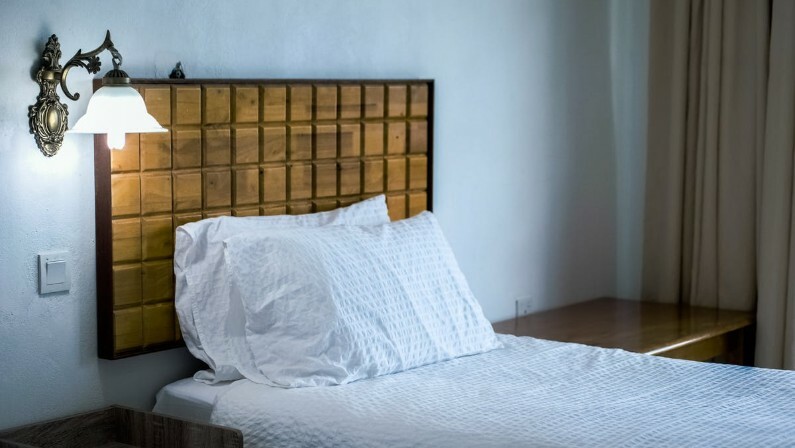 Bamboo pillow reviews from real customers show positive experiences, so we chose this as a great option for side sleepers. For sleepers, like me, who experience discomfort from allergies or asthma at night, a hypoallergenic pillow is essential. These pillows are resistant to dust mites and do not emit common allergens that other pillows produce. For this reason, we recommend the Snuggle-Pedic bamboo pillow. As an added benefit, this pillow manufacturer offers FREE customization. If you don’t find the pillow perfect, you can return it along with specifications and they will modify it and send it back. The bamboo pillow review of this process indicates satisfaction. Click here to learn more about this pillow! The Lunavy Adjustable Fit pillow is a great budget bamboo pillow. 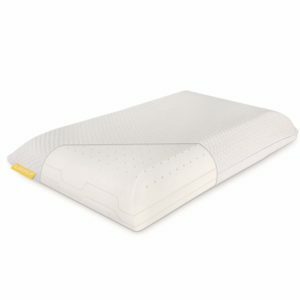 It’s also adjustable to help keep a wide variety of sleepers comfortable, whether you sleep on your side or your back. Shredded memory foam and washable, breathable bamboo covers are a common match. 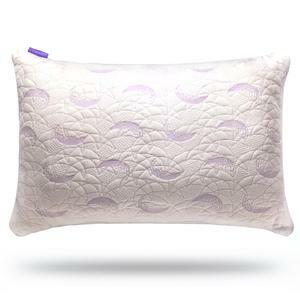 This pillow allows for you to adjust the density of the foam inside to get the perfect night sleep. Many of the bamboo pillow reviews for this product share examples of great nights sleep after the purchase. They are described as comfortable, cooling, and they provide ample support. For even more bang for your buck, you can get this two-piece set of bamboo pillows for just over $30. The Plixio 2-pack of bamboo pillows is quite affordable, and very comfortable. That’s a great deal at $15 per pillow. 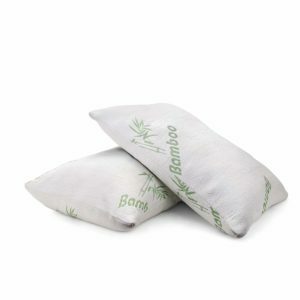 The bamboo pillow covers are described as a soft and cooling alternative to down or latex pillow materials. Click here to learn more! 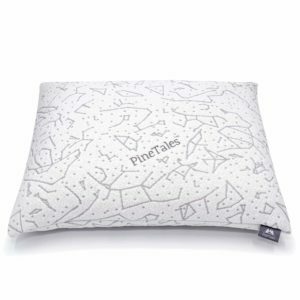 The PineTales bamboo pillow is Made in America, and very well-rated in bamboo pillow reviews. This standard size pillow gets great reviews and offers hypoallergenic materials, cooling at night, and adjustable foam inside. It touts a breathable bamboo cover allowing you to access the stuffing and make changes. As with all the pillow options, this one is affordable. 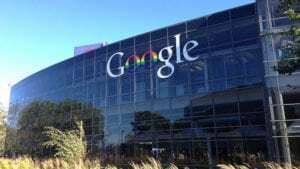 It is also made in the U.S.A., which is great news for those looking to shop local and support domestic businesses. Click here to learn more! Most bamboo pillows cannot be washed by using a washing machine. In some cases, if the pillow is constructed with a bamboo pillow cover, it might be laundered. Always follow manufacturer directions when washing your pillows. You’ll also want to follow general guidelines for keeping pillows fresh, including replacing your pillows often. 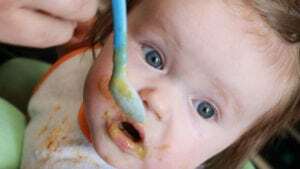 Why are our recommendations trustworthy? Experience – The SleepZoo team loves to sleep, just like you. Chris Brantner, president, is a Certified Sleep Science Coach and reviews all of our recommendations to ensure we’ve made the best selections to share with our readers. Chris has been featured in Forbes, Bustle, NBC News, and more demonstrating his passion for good sleep. Passion – It makes us happy to know that our readers get better sleep because of us. We don’t believe that caffeine is a substitute for a good night’s rest. We want to offer the best resources, tips and buying guides to our readers. Testing & Research – We conduct thorough research and hands-on testing for each product to make the best recommendations. We utilize first-hand testing, third-party resources, and verified customer reviews to gather our data. Price – We looked at the typical price points for pillows of all materials to make sure that the recommended bamboo pillows were competitive on the market. Reviews – Consulting bamboo pillow reviews give us insight on what people like and don’t like about the product. We used this to pick the best bamboo cover pillows we could find. 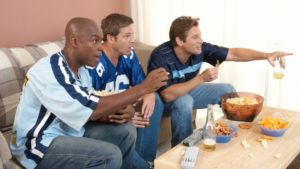 Quality – We also want to be sure that we’re recommending a quality product. Based on the information from the manufacturer and customer reviews, we believe these are the best brands available today. MyPillow Review: Is the MyPillow Any Good?